The ignition circuit cut-off system (comprising the sidestand switch, clutch switch and neutral switch) has the following functions. 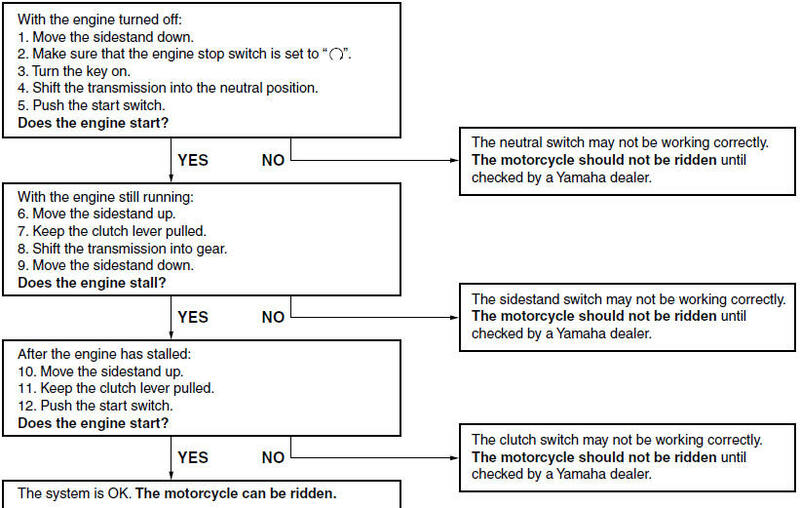 It prevents starting when the transmission is in gear and the sidestand is up, but the clutch lever is not pulled. It prevents starting when the transmission is in gear and the clutch lever is pulled, but the sidestand is still down. It cuts the running engine when the transmission is in gear and the sidestand is moved down. Periodically check the operation of the ignition circuit cut-off system according to the following procedure. If a malfunction is noted, have a Yamaha dealer check the system before riding.